What Music Do Writers Listen to? New rule: if there’s a Lamborghini on the cover, you know it’s good. While I was writing No Sleep till Doomsday (Dru Jasper series, book 3), much to my surprise, I found myself listening to a certain Ukrainian pop music album over and over. My book features an evil crystal sorceress named Lucretia, and there are subtle references throughout the book to the song “Lucretia, My Reflection” by The Sisters of Mercy. Searching for music to write by, I found all sorts of cool covers and remixes of “Lucretia, My Reflection.” The one version that really captured my attention was by a Ukrainian electronic artist called ZXZ, on the Crystal Blue album. A song about Lucretia (my crystal sorceress), on an album called Crystal Blue. Was it fate? I decided to track down ZXZ and find out. 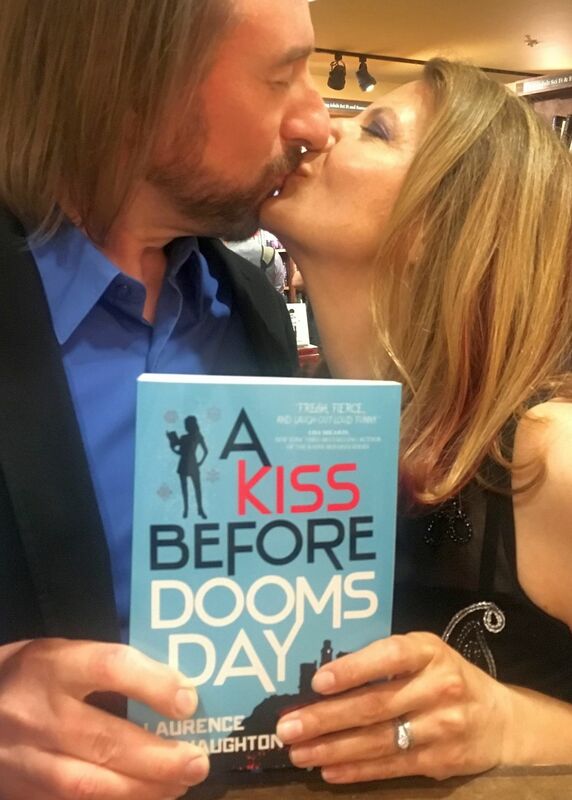 In case you missed it, the Science Fiction Book Club chose A Kiss Before Doomsday as a featured pick. Which, as an author, is incredibly exciting. To celebrate, I put together a behind-the-scenes special that the book club shared with their members this summer. If you’ve ever wondered where writers get their ideas, read on. Dru Jasper now officially has her own book series. (Yay!) So if you haven’t tried it yet, now is the perfect time to start. Plus, you can get a free bonus ebook. 1. Get the first Dru Jasper ebook for $1.99 (hey, that’s 89% off). 2. Tell me when you leave a review (on any website), and I’ll send you the latest Dru Jasper novelette, Put A Spell On You, for free. It’s my gift to you. But! The deal only lasts until October 2. So get it while it’s hot! 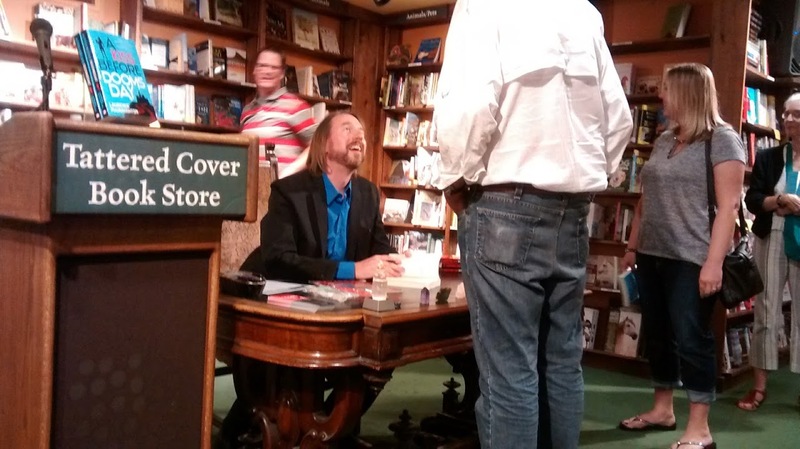 As always, the Tattered Cover was a fantastic place to do a book signing, and I’m eternally grateful to all of the wonderful people there for having me. Sorry about the mess. 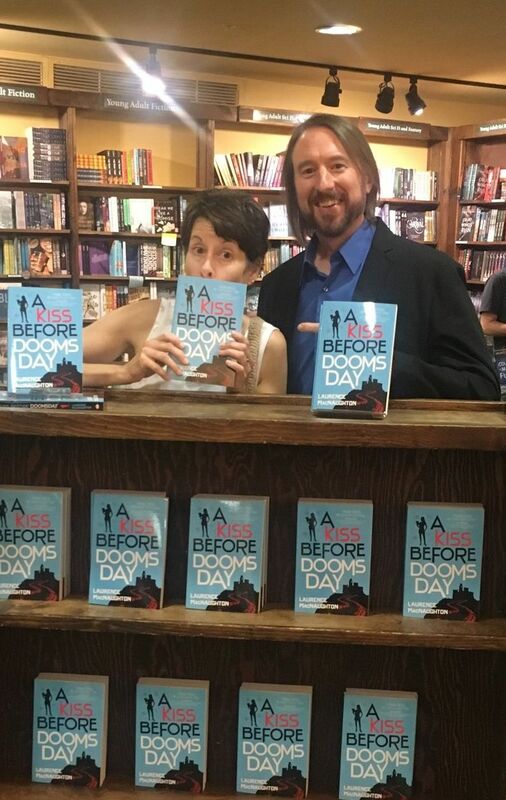 I did get the chance to make new friends and talk about the inspirations behind A Kiss Before Doomsday, including secret underground bunkers, magic crystals, go-go boots, demon-possessed muscle cars, and the fact that zombies don’t drive. At least as far as I know. Then I read one of my favorite scenes, answered a bunch of questions from my endlessly smart readers, and gave away handfuls of brightly colored crystals – in this case, sucrose crystals. (Rock candy!) Afterward, we celebrated at the scrumptious restaurant next door, modestly called The Goods. None of it would’ve been possible without my unstoppable agent Kristin Nelson, my tireless editor Rene Sears, all of the good folks at Pyr, and most of all, the support of readers like you. Thank you so much for making this book a success! I’m a fairly tall guy, but my friend and fellow Colorado author Kevin Wolf is six-foot-six. True story: my lovely wife’s go-go boots are so fabulous that I actually put them in the book. Watch for the scene where Dru goes undercover at a sorcerer’s masquerade. These are the boots. Now available in paperback, ebook, and my favorite format of all – cake! 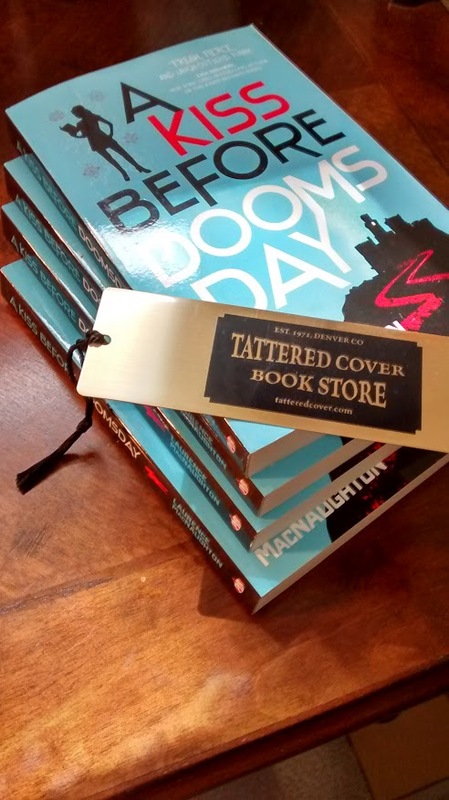 The coveted “golden bookmark” from the inestimable Tattered Cover. This is seriously cool. I don’t feel worthy. I love top 10 lists. Maybe I just love reading them and trying to think of two or three things they left out. Or maybe that’s just me. At any rate, this is a list that you definitely need to check out. Recently, I had the great pleasure of chatting with notable Colorado author Mark Stevens, host of The Rocky Mountain Writer podcast. 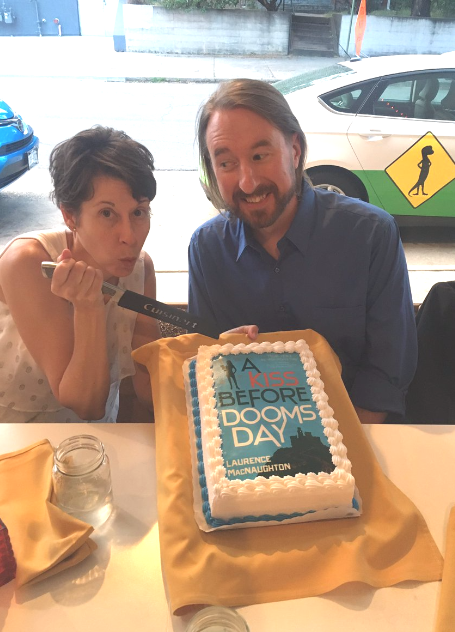 We chatted about writing and publishing, and I read an excerpt from my upcoming book, A Kiss Before Doomsday. Listen to the RMFW podcast here. When an ancient curse threatens the neighborhood Chinese restaurant, can Dru solve a cryptic riddle, stop an angry spirit, and resist heaps of amazingly tasty dumplings – before an evil army of fiends conquers the world? Exciting news! I’ve just released the newest Dru Jasper story: Put A Spell On You. To celebrate, I’m giving away several copies to my readers. Leave a comment below and you could win it for free!